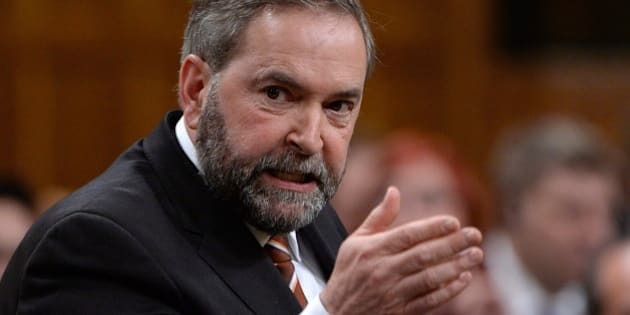 It will be hard for the federal government to justify the approximately 1.2 million requests for private information from telecommunications companies, NDP Leader Tom Mulcair said today. Canada's interim privacy commissioner revealed Tuesday that nine telecommunication companies got a total average of 1,193,630 requests for private customer information every year. Chantal Bernier told a Senate committee that she would like federal privacy laws changed so that service providers have to break out statistics to give Canadians an idea of how many requests they comply with. Mulcair took aim at the government for making the requests in the first place. "It’s an abomination. This is a basic right in our society," he said. While Mulcair criticized the government for the requests, Prime Minister Stephen Harper said it's "investigative authorities" like the RCMP and Canada Border Services Agency that would make those requests. "Telecommunications companies obviously do co-operate with law enforcement and other authorities from time to time in various investigations and surveillance," Harper said in question period. "When information is required to be handed over according to a warrant, our law enforcement agencies do that and ... there is independent oversight to ensure that is done." "The government is not involved in those investigations," he added. It's not clear how many of an estimated 35 million Canadians are swept up in the approximately 1.2 million requests, but Mulcair called it a massive privacy invasion. "Think of that as a proportion. How can that possibly be justified?" he said, speaking to reporters after the NDP's morning caucus meeting. Harper and Industry Minister James Moore referred in question period to legislation in front of Parliament to update federal privacy laws, which they said are 10 years old. But Liberal Justice Critic Sean Casey is raising concerns about those bills, S-4 and C-13. In a letter to Bernier earlier this week, Casey said Bill S-4 would make "specific changes to the powers of the privacy commissioner." "I am concerned about the consequences this legislation might have on Canada's privacy regime," Casey wrote in the April 28 letter. Casey said Bill C-13 would change "several provisions of the Criminal Code allowing for the obtaining of metadata and other information," and asked for Bernier's assessment of the bills. Conservative MP Daryl Kramp, who chairs the public safety committee, said he has never heard that anyone is concerned about the information being provided. "If there was a serious concern, quite frankly, I’d certainly expect the privacy commissioner would have approached us," Kramp said. "Quite frankly now, I think you’re fearmongering and scaremongering yourself ... A million times? Like, show me. Show me." He said it's a hypothetical question to ask whether Canadians should be told if their personal information is released to the government by their cellphone providers or others. "You should know better than to ask a question like that. Because [it would be] based on what? To what degree of danger? What degree of fear? What degree of challenge? What degree of potential security? What degree of human impact could that have? There’s a whole variety and it’s not a simple black and white, [clear-]cut issue." Liberal Leader Justin Trudeau said it's "extremely disconcerting" to see so many unanswered questions and said he wants an inquiry if the government can't clearly answer those questions. "How many times exactly did the government ask for personal information? What were they asking for? What did they receive? Why were they asking for this information? — these are all questions we have no answers to," he said. The Conservative government, he said, is behaving in a way that is disrespectful of Canadians' privacy. "I think Canadians need to express to this government how concerned and how outraged we are about these potential violations of our privacy." Bernier said a past report from the privacy commissioner's office recommended updating federal privacy laws "to create an obligation for private entities to give statistics of the number of requests that they accede to without a warrant to give personal information." She said she understands that in some cases, police can't wait until they have a warrant to request that information, such as when there's a risk to someone's life. But she would like to see a legal obligation for the statistics to be available "to give Canadians an idea at least of the scope and nature of those activities without compromising obviously the activities because all it would be is statistics," she said.